Atlanta gibbosa is of moderate size (to 4 mm). The shell is completely transparent and colorless, and the walls are thin. 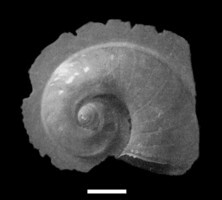 The shell surface is smooth, lacking any sculpture. The keel is tall with a truncate leading edge. 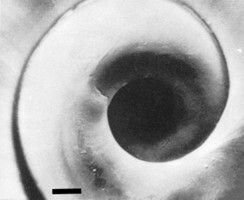 The keel penetrates between the penultimate and last whorls in shells larger than about 2 mm. 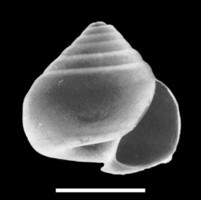 The shell spire consists of about 6 whorls and reaches a total of 7-1/2 whorls in full-grown specimens (highest among all Atlanta species). The spire shape is unique among the species with inclined spires; broadly conical with a wide base, a narrow, rounded apex, and an apical angle of about 85°. The spire sutures are moderately deep. 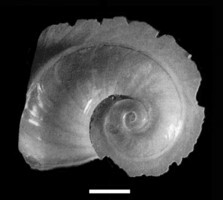 The left side of the shell has a conspicuously wide umbilicus. Eyes type b; lens large in adults. 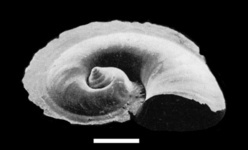 Operculum type b, and very thin. Radula type II, with a growth angle of about 15°. Radula with strong sexual dimorphism in width and tooth morphology. 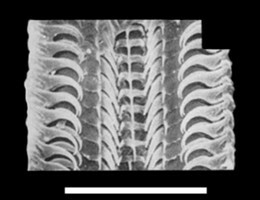 The radula is about 25% wider in females than in males. The marginal teeth are much shorter in males than in females, and their shape is very different in males (as sharply-curved, short hooks) than in females (elongate, with more weakly-curved hooks). 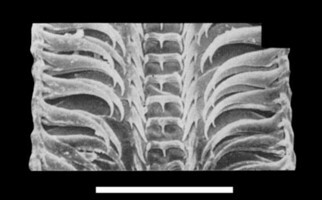 Also, in the male radula the short pair of marginal teeth leave a conspicuous gap between their hooked ends and those of the lateral teeth. The species is most probably limited to the Indian and Pacific Oceans, and is found in tropical to subtropical waters. Atlanta gibbosa and A. meteori comprise the Atlanta gibbosa species group. The two species share a series of characters (summarized in Richter and Seapy, 1999): (1) shell is transparent, colorless, and fragile with thin walls, (2) keel is tall, with a truncate leading edge, (3) keel penetrates between the penultimate and last whorls in shells larger than about 2 mm, (4) eyes are type b, (5) lens of the eye in adults is conspicuously large, suggesting that the species prefers greater daytime depths (Richter, 1974), (6) operculum is type b, (7) radula is type II, with a moderate growth angle of 12-15°, (8) lateral teeth are relatively straight; not noticeably curved as in most species, and (9) rachidian teeth are wide, with a broad base; considerably wider than in the Atlanta inclinata species group. 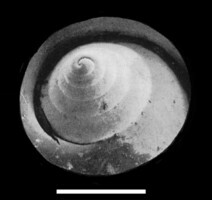 The two species differ in: (1) spire shape, which is broadly conical (apical angle about 85°) and with a narrow apex in A. gibbosa, and narrowly conical (apical angle 60-70°) and with a rounded apex in A. meteori, (2) spire sutures incised, forming distinct sutures in the former species, and shallow, resulting a nearly smooth spire surface in the latter one, (3) umbilicus conspicuously wider in the former than in the latter species. 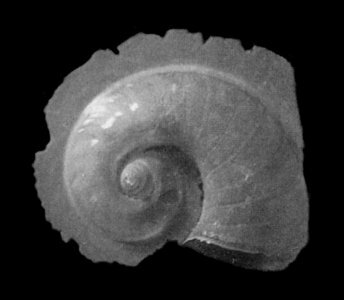 Atlanta gibbosa has been recorded from the Indian and Pacific Oceans, although it has not been reported from the Atlantic Ocean with the exception of a single record by Souleyet (1852) that cannot be verified from voucher material (discussed by Richter, 1990). Richter, G. 1990. Zur Kenntnis der Gattung Atlanta (IV). Die Atlanta inclinata-Gruppe (Prosobranchia: Heteropoda). 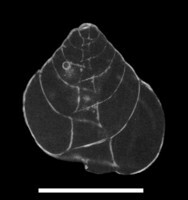 Archiv für Molluskenkunde 119: 239-275. Page: Tree of Life Atlanta gibbosa Souleyet 1852. Authored by Roger R. Seapy. The TEXT of this page is licensed under the Creative Commons Attribution License - Version 3.0. Note that images and other media featured on this page are each governed by their own license, and they may or may not be available for reuse. Click on an image or a media link to access the media data window, which provides the relevant licensing information. For the general terms and conditions of ToL material reuse and redistribution, please see the Tree of Life Copyright Policies.